Yesterday I was on color overload and I loved my outfit. Today I’m sitting in cream and beige and I hate it. I feel as boring as I look. And I knew it as soon as I settled and put on clothes I didn’t love. The other night at dinner I had on a black high waisted skirt, cream blouse, salmon cardigan, black tights and wild floral Mary Jane platforms that I adore. My sister told me I always like the wild stuff like color and pattern and she said almost as if that was such a vile and bad thing – to be different, colorful or wear pattern. HA! That comment and many others at work about what I wear and how bold my color choices are really got me thinking about my personal style and what makes me happy. 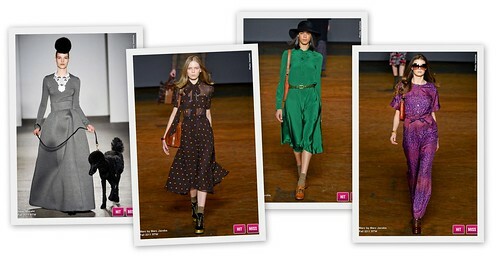 These four images (all from The Cut’s iPad app) are ones that I saved while browsing the fashion week shows. Three out of Four are Marc by Marc Jacobs and the grey dress is Isaac Mizrahi. I love them all but wish the Isaac Mizrahi dress was in a more vibrant color like Kelly green or orange and then I’d think it was perfection. I’m inspired by bold color, pattern, texture, bold shapes. I don’t have the budget for Marc Jacobs but I do the best with what is within my budget and I’ve always wanted to be an individual and wear what made me happy. When I was five I wrote a letter to my Mom kind of demanding (yes, I was bossy even at 5) to pick out my own clothes. She negotiated the terms with me (I had to pick my clothes out the night before and lay them out on my toy box and they had to be pre-approved) but she let me be an individual even at five. She’s never loved my clothing choices but she always told me it was my wardrobe not hers and I appreciate that. I dated a guy once who wanted to tell me what to wear and that didn’t last very long. And my husband has totally backed off of trying to pick out clothes for me because he just doesn’t get how I put my outfits together but he likes me style. Style is so personal and individual and unique and although every day isn’t a runway day for me (like today) I realize I feel so much better when I do take the time to put together an outfit that really does showcase me. So after all this rambling, I’m curious, what’s your style inspiration? What do your clothes say about you every day? I would call my style “classic modern”. I love really unique and out the box outfits, on other people, but on me I don’t feel at home in them. I love dresses and I will take a basic shift in black or grey and incorporate modern and quirky elements through shoes, jewellry, or layering other things with it. I also love re-interprited classics, high waisted pencil skirts, tulip skirts with fabu draping, shift dresses with pockets! I notice when I veer out of my style comfort zone the item gets worn once and basically wasted. Oh and DENIM! You can’t have a classic modern without denim, my favorite is an inky wash in a trouser or bootcut. @theaofa I would love to if my stupid company didn’t block it! ha! I used to be able to get on but not anymore! @theaofa I can at least read it through Google Reader but I can’t comment. Since you and I are Twitter Twins you know that I’m also inspired by color. I love bold bright colors! 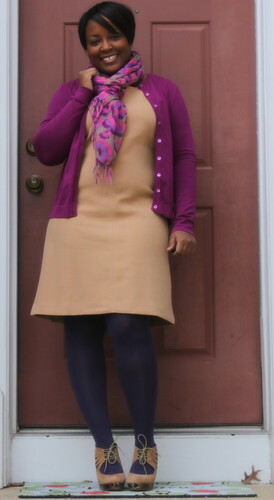 Even when I’m wearing black (which is a lot) I love to add a pop of color. I also LOVE statement accessories. A bright watch, funky shoes, crazy jewelry…and those are the things that people will always comment on. I guess I’m a little like you in that ANY type of color or vibrant print instantly catches my eye. I can’t get enough!